香辣雞翅 – Qualiko. Good for your family! 1. Split wings at joint and discard tips pull the meat to the end of joint. 2. Arrange on a rack in a roasting pan. Cover wing pieces with sauce on both sides. 3. Bake at 220°C for 1 h, turning halfway through cooking time. 4. Wings can be deep fried at 200 °C for about 12 minutes and then dipped into the hot sauce until coated completely. 5. Cut potato into wedges. Marinate and roast the potato inside the oven 180°C for 10-15 min. 6. Boil the broccoli and season with salt. 7. 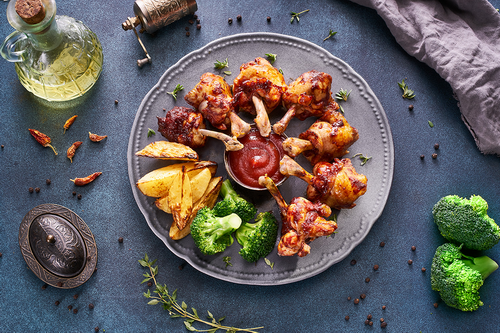 Arrange the vegetables and potato in the plate with the chicken lollipop and serve with the buffalo sauce.